WOW HEAT WAVE!!!!! So here is the summer we have all been waiting for, smacking us in the face with 37+ degrees and no wind! So as much as I was filled with the excitement of exploring the city we were also very much slowed down by the intensity of roaming around in the busy streets, but that didn’t stop us from venturing out on our bikes to explore the sites and generally roam around. 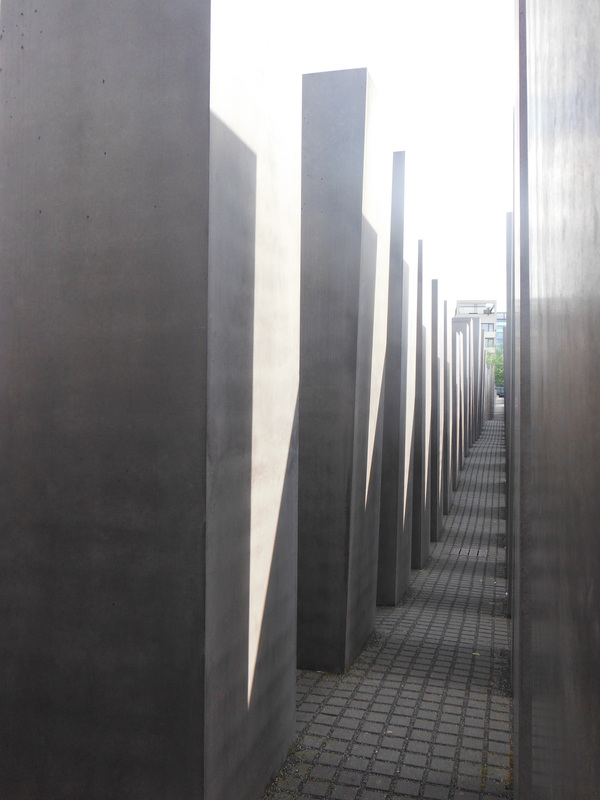 I think that I, along with most really appreciated the Holocaust memorial, the stone pillars are striking and powerful in a way that I haven’t experienced before. As Anne had been inside many times she kindly offered to sit with my things so that I could roam free among the stones and really tap into the energy of the place without being influenced by anybody else. It really does provide a very dramatic effect when walking into the stones, the ground beneath your feet drops and the pillars begin to loom higher and higher above your head cutting off any real association to the world outside and you are suddenly lost in the maze! Anne had explained how this is what both the Germans and the Jews must have been feeling, slipping further and further into the unknown, getting lost in the maze of life while never knowing if or when they would find the exit again and if they do what kind of a world would they be returning to. I really kept this in mind while walking around but its sometimes hard as you bump into the throngs of people playing hide and seek or just excitedly shouting wildly at one another as they get separated, all in good spirits tho as we all enjoyed the space in our own different ways. As I emerged from the opposite side I thought it was time to take some pictures so I asked a kindly looking gentleman from Southern Germany who was also alone and we set about taking turns in swapping cameras and poses while I filled him in on why I was there and what we are trying to achieve. He was really touched by my story tho I am sure a lot was lost in translation but I gave him a sticker, wished him a good holiday and I made my way back out to Anne. 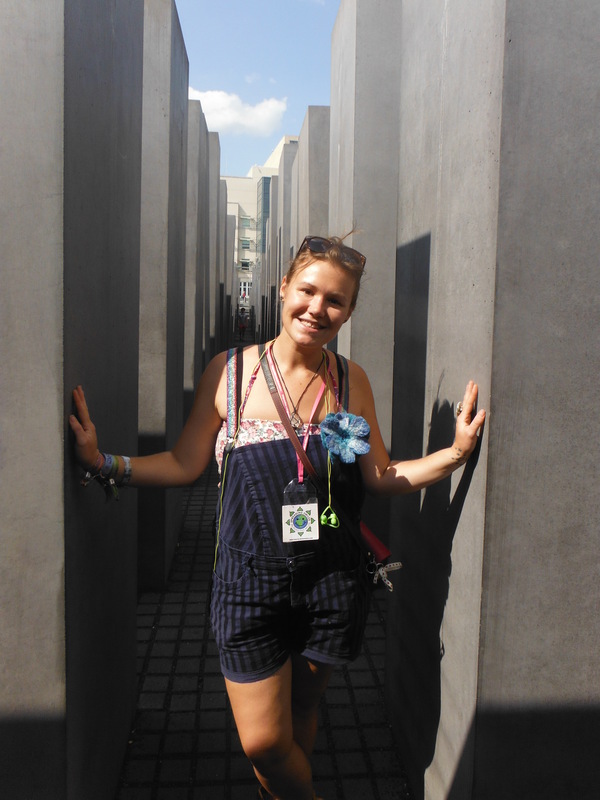 The Holocaust Memorial Stone Pillars! 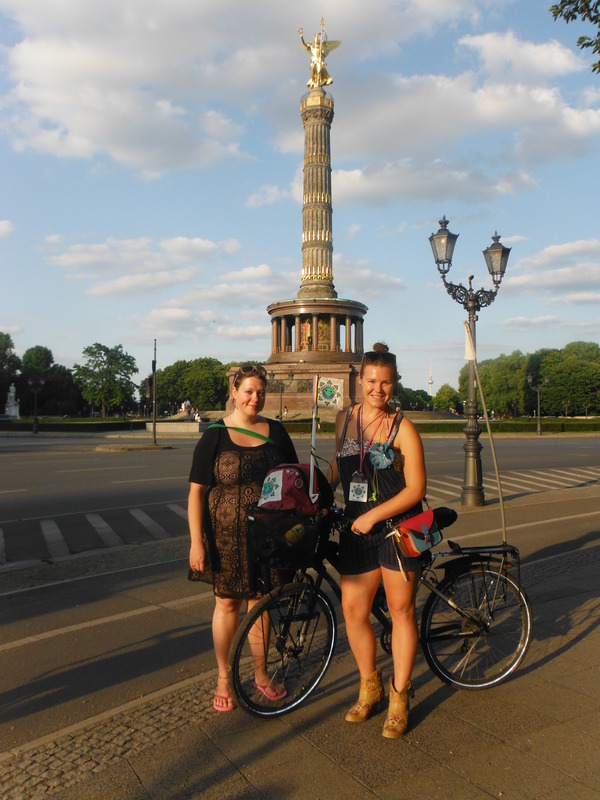 Berlin seems to be full of monuments and historical pieces, all grand and beautiful and seemingly linked to the war which also gives them a rather tragic energy I felt but still enjoyable to look at, so we did the rounds and Anne was great at filling me in on their history. 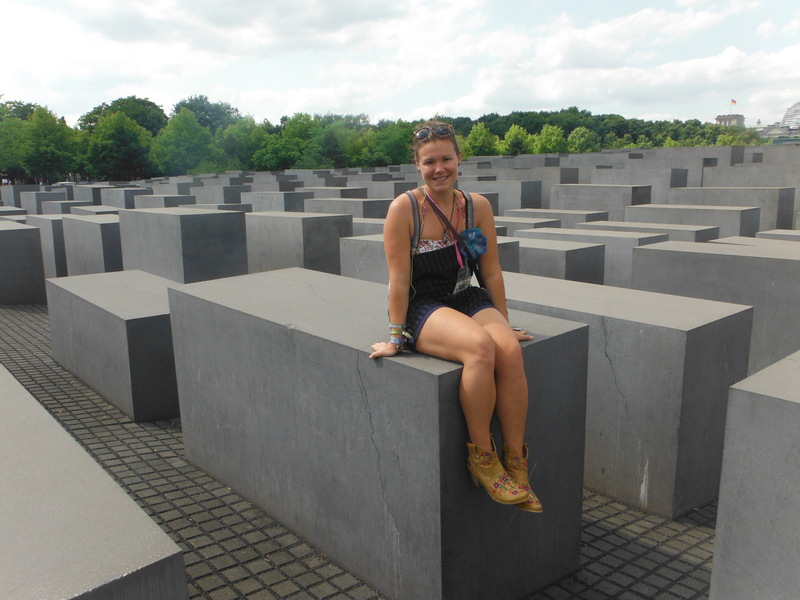 There is also a lot of parks in Berlin which are very refreshing when staying in a concrete jungle and especially in such heat so I really enjoyed being introduced to these areas, my favourite of which used to be the old airport and is situated right in the centre of the city and really is a sight to be seen. There is always something going on, whether it be football practice, BBQ’s and frisbee, roller-blading or a group of Jewish musicians enticing the passing crowds to come sit, dance and socialize. This is of course where we navigated to, enjoying the music and people watching until the thunder claps strikes, lightning filled the sky and we jumped aboard our bikes and headed home in the heavy yet refreshing rain. Me and Anne in front of the golden angel, this monument managed to survive the war and still looks immaculate! 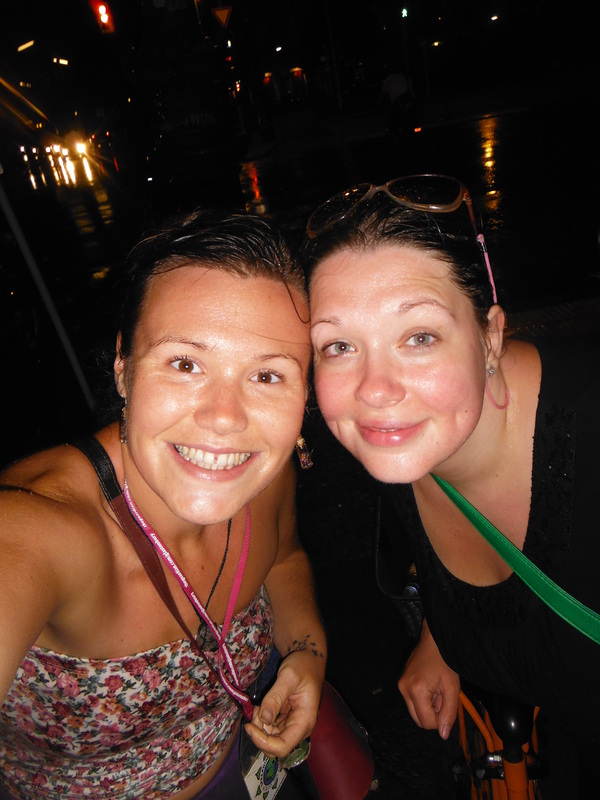 Felling refreshed and happy after our dash from the park in the pouring rain! I haven’t seen lightening quite like this in YEARS!!! At the end of the scorching hot days the sky lit up with huge sheets of forked lightening, releasing all the pent up energy that had been forming! The most impressive display was on Saturday night. 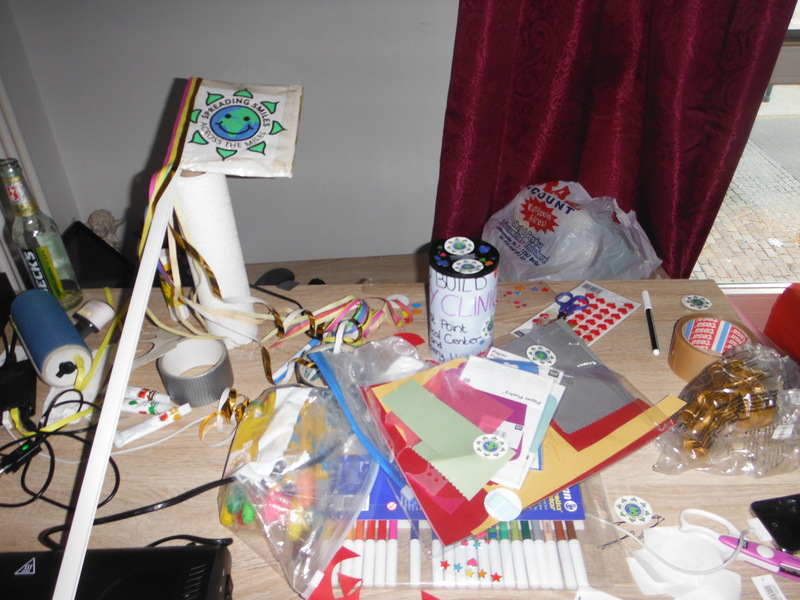 Me and Anne had spent some time making me a new, portable flag, ring, lanyard etc to prompt peoples curiosity and then we headed off to a park under the promise of some kind of festival. We didn’t find a festival but a portable DJ and sound system playing to a busy field but next door there was a youth centre having a fund-raising day with many different acts, food etc. We managed to time things just right and sat back to enjoy the end of night fire show, got chatting to the guys behind it all and help with a little clean up. We headed back to Anne and Christians apartment to re-stock and then headed out into the lightening to our final detonation for the night which was an open air party on a large building site. The party was in full swing when we arrived but it took no time at all until we had made some friends, the rain stopped and we danced until the sun came up and we were two of the last ones there before dragging our tired asses back for some well deserved sleep but not for to long as today was flea market day! So after a good but short sleep Christian and I headed off for the flea market and Sunday music sessions in the park next to it, the fence between them also represents where part of the wall used to be. Of course being the sucker that I am for a good bargain had to practice my restraint in the market, but not that well as I bought myself a pair of embroidery decorated boots that I regretted almost instantly when I got home and the reality hit that I had to carry them back to England! I will never learn! Ha We then ventured into the park and enjoyed the large variety of buskers that scattered around playing their hearts out in the afternoon sun, my favourite along with many others were a couple of guys on adapted drum kits. Apparently they are there every week and the crowd loves them, in no time at all a huge group had formed and the dance floor was alive with swirling colours and the air cloudy with dust from our stomping feet. There’s nothing quite like a good dance to finish off an awesome day! Flower powered up and ready for some Saturday fun times! 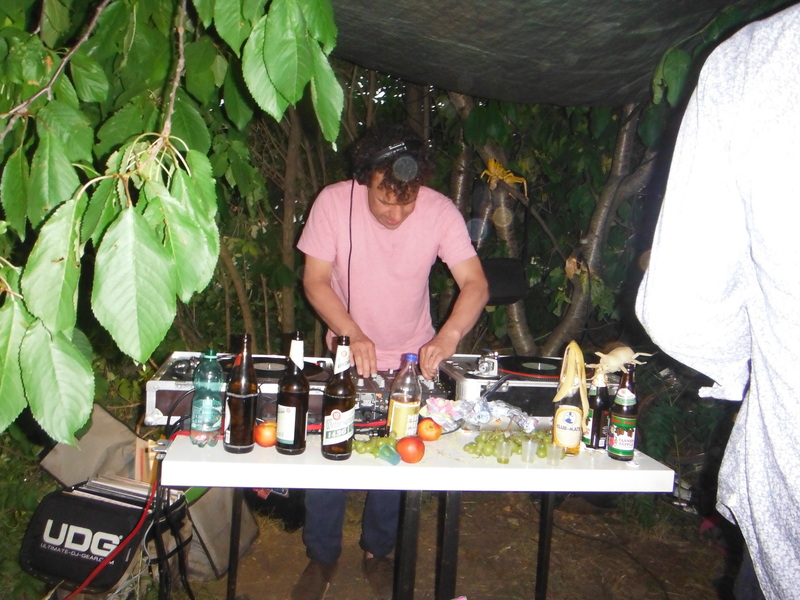 DJ at the Open Air Party! 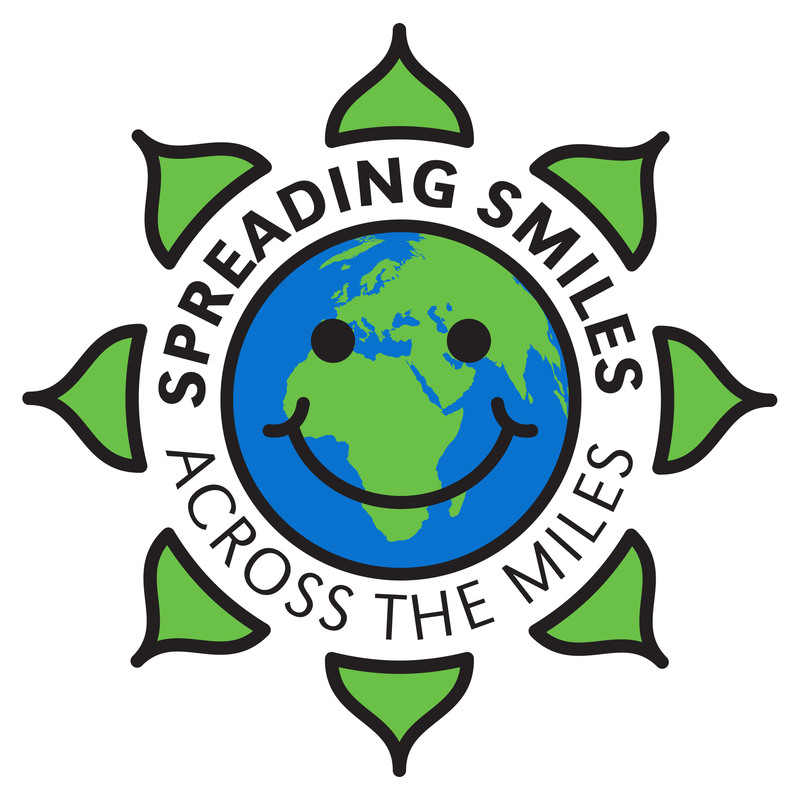 Arts and crafts time to promote Spreading Smiles Across The Miles! 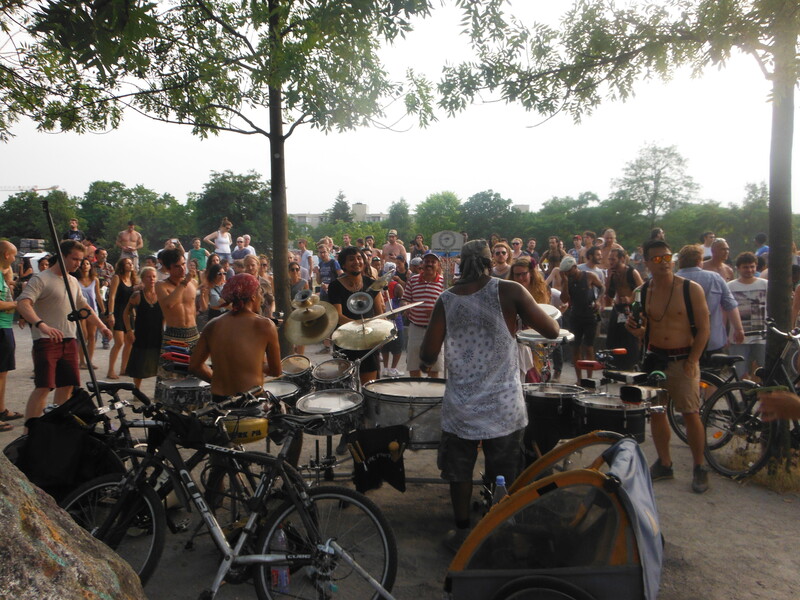 Time to dance with the drumming guys in the park! 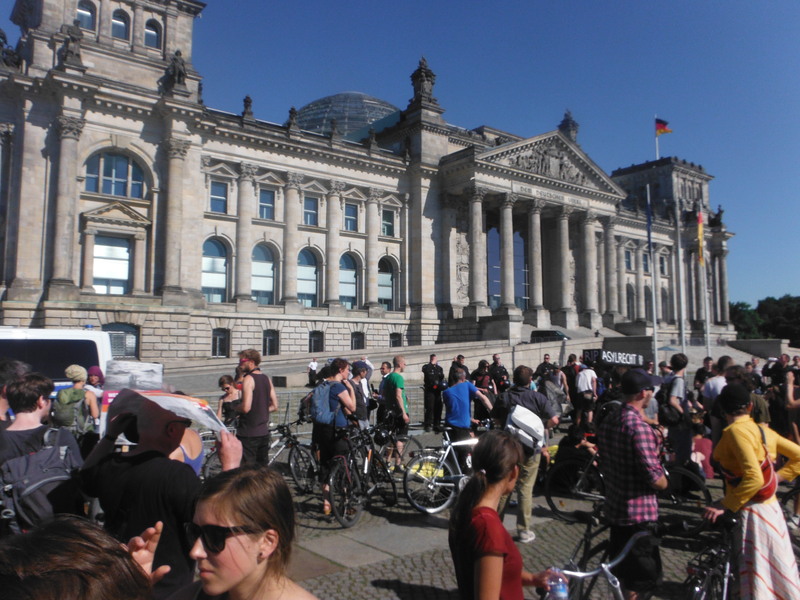 Its hard to cram into a blog all that I experienced in Berlin so I will finish off with my visit to Bike Citizens, a connection I had made while back in Bremen at the same time I met Jens and Tessa. We had been going back and forth trying to arrange a date to meet and finally managed it the day before I left. I met Andreas and his colleagues at their new office by the river, we walked round the corner for lunch and a chat, I then got the pleasure of a guided tour of the area which was fastening. 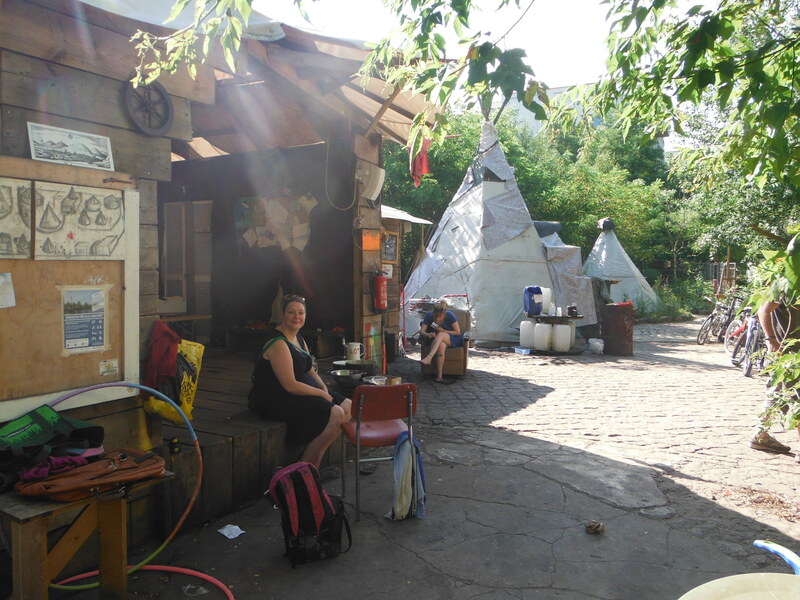 The whole area had and was home to all sorts of funky buildings that had been squats and clubs over the years, but as he walked me along the river bank we came across a really awesome little community called TeepeeLand! This patch of free land had been inhabited by free willed people for years and was well set up with gardens, kitchen area, toilets, communal hang outs etc and held an open door policy for those travelling by but was permanently inhabited by a number of people that no one could specify. Me and Anne returned later and spent some time hanging out and exploring it in more detail. Back in Andreas’s office he told me all about Bike Citizens which is an app they have created for city maps designed specifically for bikes and also their extremely useful smart phone holder to attach to your bike. The concept is brilliant and I happily agreed to help in any way I could by encouraging people to use the app which is free if you manage to cycle at least 100km in the first month of using it which I thought was a great intensive for people to cycle more. Primarily based in Europe I think they have about 150 cities which is only growing with hope of hitting America as well. As they have an online magazine I proposed the idea of entering a story about my trip so contact was made with the leading lady in charge of this area and fingers are crossed tho I would be writing the article myself, hopefully my blogging will have improved my writing skills! 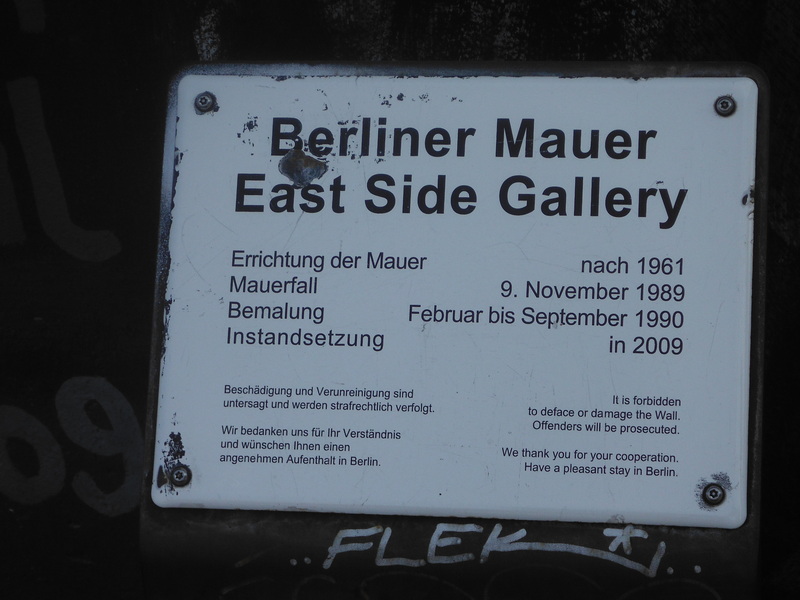 After I had said my goodbyes I set off with Anne and we went to check out the East Side Gallery which is part of the Berlin Wall that has been opened up for artists from all over the world to graffiti, there were some really awesome pieces! 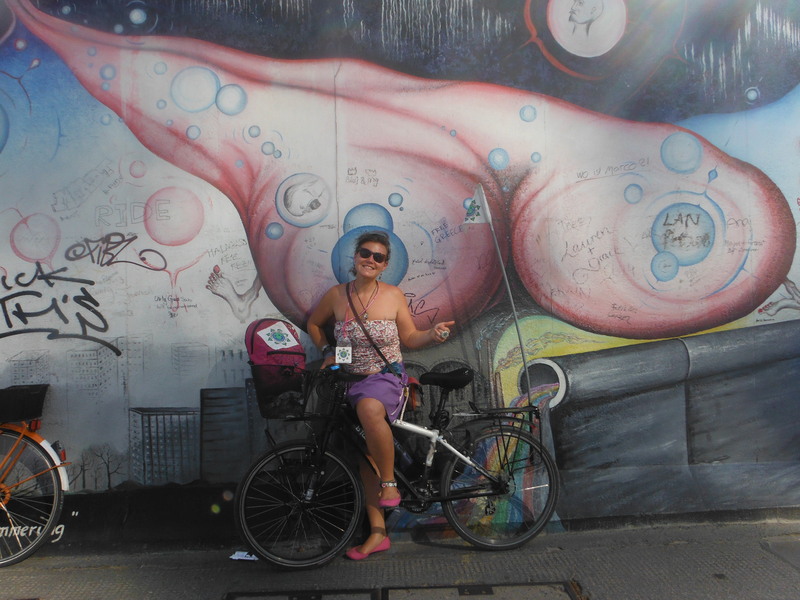 Part of the Berlin Wall – East Side Gallery! Before heading back off again on my bike I packed up my now seemingly larger amount of belongings, made a last dinner for Anne, Christian and myself and sat down with Christian the computer wizard to try and sort out some of my website issues. I have become very aware that people have been struggling to make donations online and that all my hard work of passing out the details and telling my story is resulting in inspired people but not raising any funds. So we decided to add a PayPal account to the donations page but unfortunately they take a large sum for their services which is not idea! He also helped to include a help button and a form of direct contact to me, hopefully people will inform me in the future if they have difficulties and we can resolve them. Christian and Andreas both stressed to me how important it is to get as much publicity as possible so PLEASE, PLEASE encourage your friends and family to sign up to follow my blog and help us make a difference! But for now it is time to jump aboard my bike again and head off into the unknown, next stop Hannover! An undisturbed nights sleep later I packed up and off I sped through the little country towns heading for the big city, even tho I had a few wrong turns there was always somebody happy to point me in the direction. 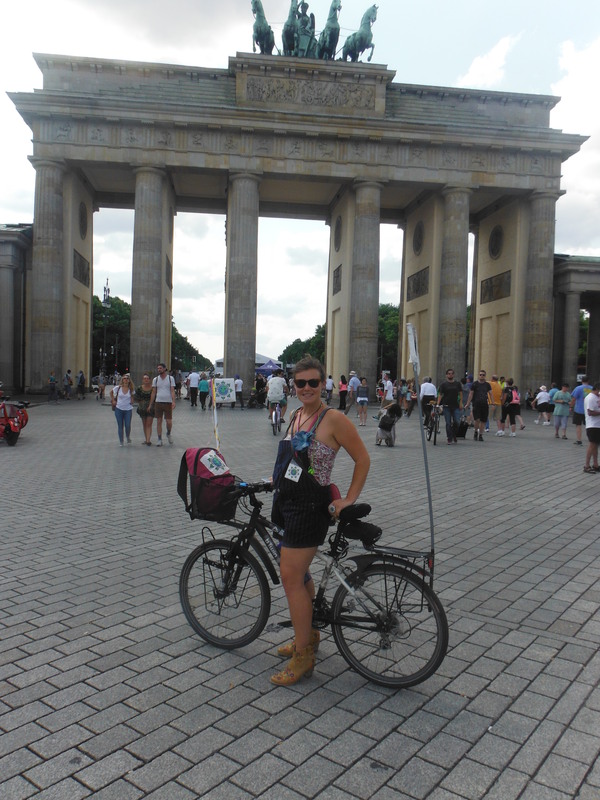 It seemed like no time at all that I was on the home stretch and was very pleasantly surprised when I told a young lad that I wanted to go to Berlin and he looked at me strangely then informed me that I was actually already in Berlin! After getting over the fact that I didn’t just want showing to the nearest underground he had a look on google maps and off I went. 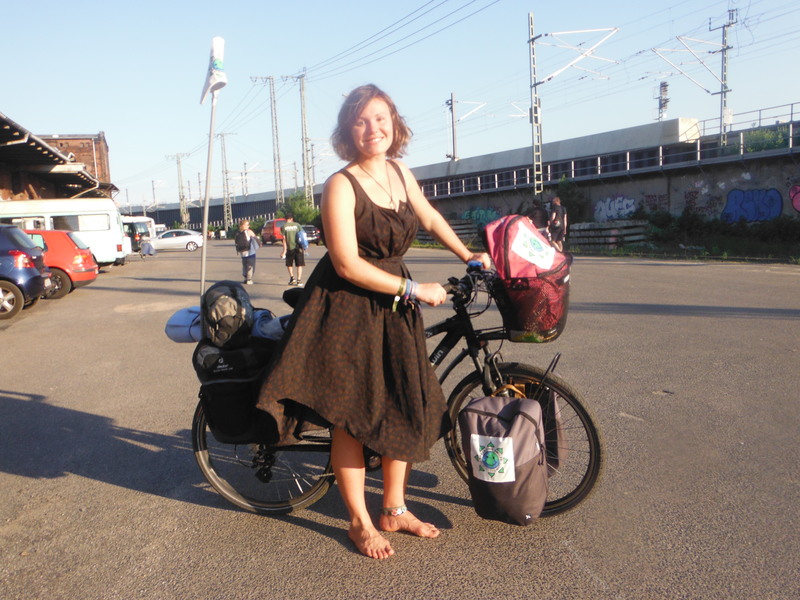 I had barely made it into the city when I made my first new friend who cycled with e for a while chatting before leaving me me to travel the last stretch to Wedding where I would be staying with Anne and Christians. I felt so lucky as the sun was shining and we set off on our adventures, heading into the city to go and see a group of young men who are refugees and that Anne has been working with since February. I have found that this whole trip has really opened my eyes to the reality of what is going on for refugees all over Europe and its really encouraging to see such large masses of people standing up, speaking out and trying to protect and improve the lives of those who have been forced to flee their countries for fear of their lives. As Anne is also quite new to the city we took the typical roundabout ways which worked fine for me as I’m always intrigued to see the real city not just the main tourist spots you are generally herded to, but saying that I also enjoy seeing the sights and that we did….. While cycling down one of the main streets I couldn’t help but notice and comment on the unusually large number of police in the road and wondered what was happening when suddenly the sound of chanting voices and loud music drifted down towards us and in no time we went head on into a big demonstration. After quickly jumping onto the pavement out of the way of this powerful critical mass that had taken over the street we started to realize what was going on, it was a demonstration against the new laws being passed that all refugees would be put into jail for a period of 18months when arriving into the country. The march was very powerful and effective, they carried a coffin up front with R.I.P REFUGEES down the sides to represent all that died in the long crossings bringing them over, large cloth banners ran down the side of the group to give the impression that they were one large unit and the whole procession was followed by an old truck that blasted out appropriate and motivational music for its supporters and with the occasional loud speaker announcement or statement from the driver within. We were passed leaflets as they passed and informed of their cause, we took a minute to ponder then decided that seeing as we were heading to see the refugees we might as well stand up for their rights and join the march. Even tho I was unable to understand everything I could join in with some of the English chanting and just be a positive part of this dedicated team, it also worked out quite well as we passed by some of the main points of interest while walking down the middle of the street so it was a great view point. The main points of interest we passed were the holocaust memorial site with all the different sized stones to walk between, the Berlin gate and the government building which is where our march (and the ridiculously large number of police) came to a stand still and set up camp in the still baking sun. Now that we had stopped I took the chance to talk to some people and find out that there was a meeting taking place at that very moment that would play a big part in the overall decision, I also learned that the demonstration had been announced to the police, all the appropriate paperwork had been requested and filled out to be able to have a shade structure, music and amplified talks while they waited. I am not sure exactly what happened but from what I could gather from the others was that the paperwork in question had been miss placed by the police and so therefore those privileges were not aloud. Walking alongside the demonstration truck! 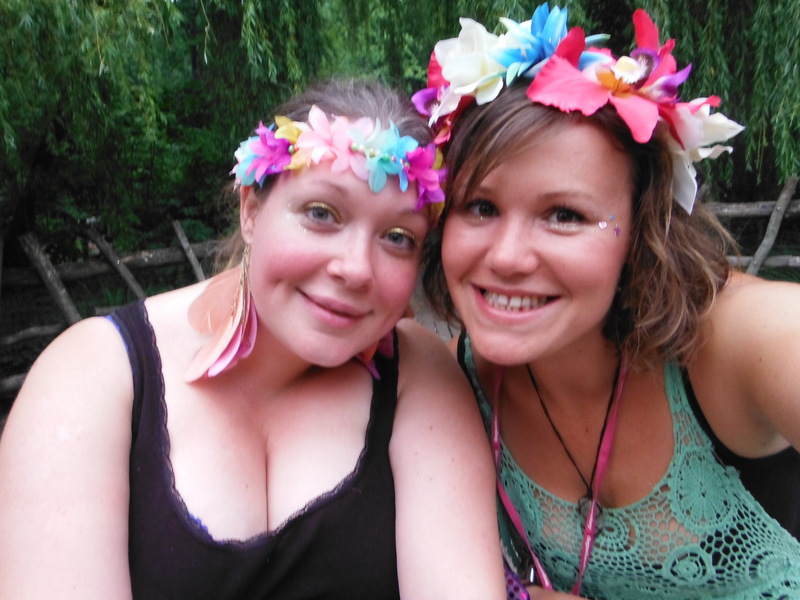 A Welcome Festival and an unexpected insight into a beautiful part of Germany…. It really felt great to be back on my bike and flying towards Berlin, the sun was shining on me once again and the pretty little towns kept me captivated with their beautiful, old architecture. I had just started to make my way out of Arensee (after a little detour after a few wrong turns, I like to call this sight seeing…! 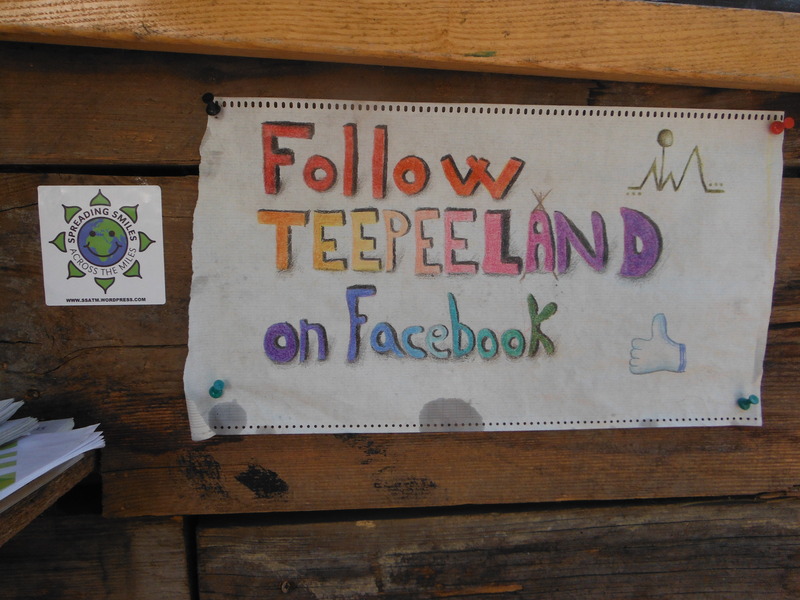 HA) when I spotted a couple of little handmade festival signs hanging on either side of a gateway into what looked like a big, old farm. Of course this a immediately caught my attention and even tho I had only been cycling for about 40miles/64km I decided it was well worth investigating so I pulled out my earphones to hear the very welcome sound of a pumping bass line wafting across the field. In no time at all i had spun around, dismounted and started making my way down the driveway with a big grin on my face as I took in the colourful, creatively decorated sight before me. Withing seconds I was greeted by a friendly and rather merry man who explained that he didn’t really speak any English but that I should most definitely come in, lean my bike up and join the brightly coloured group of happy faces by the fireplace and well rigged dancing area. I was instantly welcomed which seemed very fitting as I found out that it was actually called the ‘Welcome Festival’ which was making its third comeback. There was a beer in my hand and the choice of at least 4 different sleeping places in no time at all as I got introduced to Christian who was responsible for putting it all together and I learned that they had been expecting about 200 people over the course of the weekend but that it had been a very small turnout so had ended up being an extremely well thought out, prepared and equipped large party for the local community…. and they had been having an absolute blast! 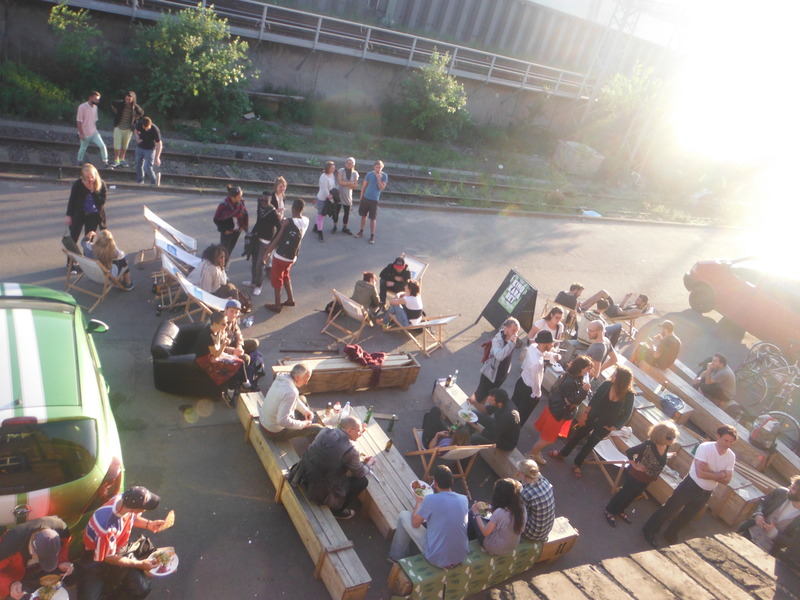 There were 4 main food and drink areas providing everybody with tea, coffee and cakes, beers, BBQ and an old Police trailer that had been converted into a mobile kitchen that packed out in front serving an ‘LECKER’ selection of vegan dishes. And as they were finishing off and were left with so much they invited me to indulge in all they had to offer, so not only was a well fed and watered I had the most incredible company to enjoy it with. I was really impressed with how much effort had gone into their set up as the DJ booth was rigged up to an impressive stage and lighting system where they had been enjoying a variety of talented musicians, DJ’s, dancing and an all night karaoke session the night before which after getting to know the group I can only imagine how hilarious that must have been… especially seeing as most of the song book was in English! As the sun went down they set up the couches and chairs and sat back to watch the last ever Pink Floyd concert on the big screen, the fire was stocked up and the rest of the night was spent chatting, drinking and jamming with the numerous instruments (plus some improvised music makers) until the sun came up and I started to have doubts about the likelihood of me wanting to leave that day. It wasn’t the lack of sleep that was swaying me but the generous offer to join some of the guys to stay with them in a local community made up of an large trailers, vans and hand constructed buildings on a big piece of property where they had bought an old railway station, which had been bought as a collective after pulling their resources and building a pizza oven on the back of a trailer and selling them at Fusion Festival. After a great if not short sleep in my very own bedroom I gave into the fact that I wasn’t going to be setting off to go anywhere that day but with my new friends so we started the job of cleaning and packing down the food trailer then I put my well practised ‘leave no trace’ skills to the test and combed the area for the usual scattering of bottle caps, cigarette buts and miscellaneous festival bits and bobs. Many hands make light work and we were done it no time and I was getting excited about the evening to come as their plan was to head to another large community living area where they had an American group called ‘Joe Buck Yourself’ playing, described to me as a country/punk band! As both me and my new friend Franz both had bikes we decided that we would cycle together and join the others there so after many hugs and goodbyes we set off for what turned out to be a long scenic ride after taking a very long route, not that I minded as its such beautiful countryside and I was learning so much about the history of the area. I was informed of the military training areas that were close by and the plans for storing nuclear waste which they were all heavily involved in trying to prevent, I found it fastening to find out that all the property here was extremely cheap and so it was becoming quite a big thing for groups of people by buy up the land and start different projects. I got an amazing example of this when we arrived at Johnny’s home and was shown around the beautiful grounds, pretty little trailers, large gardens and the brightly painted station which was under renovation after some of the children had started a fire on the roof and caused a lot of damage. The plan was to have a large communal kitchen and then rooms for guests, one side had been pretty much unaffected by the fire and thats where they had their bar and occasional party. 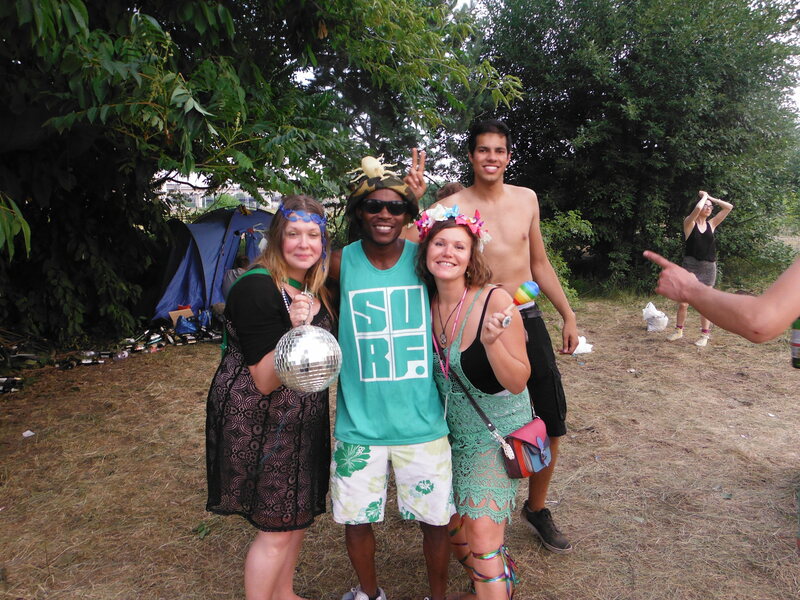 The whole place oozed character, good vibes and surrounded by people with passion…. 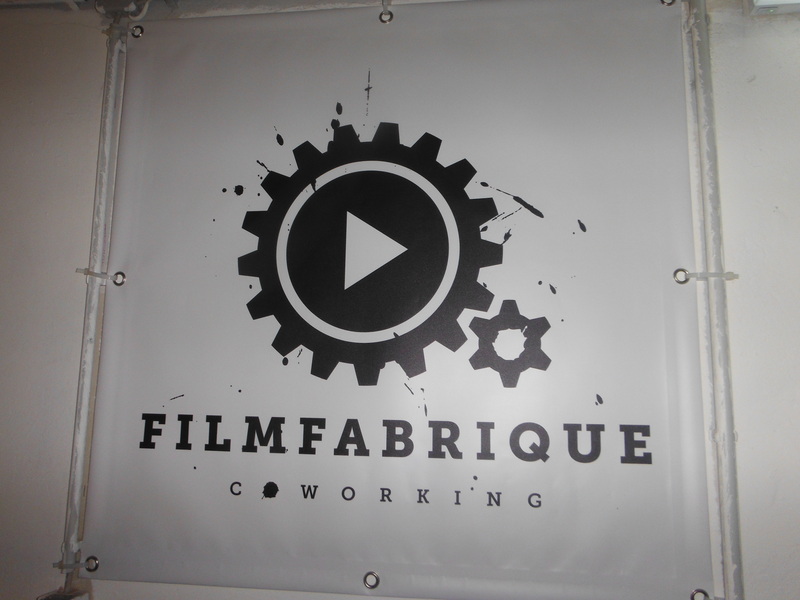 an amazing environment to be involved in! Me and Franz got the full guided tour, some more delicious vegan food then we headed off for the gig with a van loaded with sleeping gear. The venue was awesome!!! The site was huge with a mix of people living in buildings, vans, trailers and buses with at least 4 huge sheds where people could come and store their old vehicles while they weren’t in use and also have an area to work on them. I have never seen so many old, interesting vehicles in my life that varied from VW’s campers to huge old police trucks, all incredible parts of history and it was great to see that they were being kept and cared for properly even tho some of them must have been there for years! They had clearly been having a big BBQ and a fire was roaring outside the windows to the room of the gig. The entire building was made up of random pieces of scrap metal, wood and other bits and bobs being used for door handles etc and the walls covered in all sorts of different graffiti, pictures, posters of upcoming and previous events. There was a little bar selling almost cost price drinks and then a small stage area which was soon occupied by 3 separate acts, each one with their own unique twist but getting the crowd jumping, dancing and cheering for more. All I can really say from my evening is good people, good music, let loose dancing and I feel very lucky to have stumbled upon this quirky little part of this awesome country! After a surprisingly comfortable sleep in the back of the van we made our way back, I packed up the rest of my things and said my thanks and goodbyes and set off with Franz. Franz had been telling me about the really old house that he was staying in as the owner was not around and the place wasn’t in any fit state to try and rent out, his could stay there free of charge if he did the maintenance. He invited me for lunch and a look around, the property was awesome. The buildings were well over 100 years old and in their original state which I found consisted of a shop, barn for food storage, animal and hay storage and a large bungalow. The doors looked like they were made for borrowers, beautiful antiques that had naturally survived the tests of time lay around which included a radio and TV, it was fascinating to get to take a peak into how they functioned around their work, animals and home life. I thanked Franz for lunch and the guided tour and off I went, one more night in the wilds and then I would be in Berlin! 🙂 Even tho I got a few patches of rain and some wind the rest of my days ride went smoothly and included a short trip on a little ferry to get me over the river, I camped up and ate my dinner undisturbed from my blood sucking friends. Feeling very excited and pleased with myself for almost making my half way point I fell asleep, looking forward to seeing my friends the next day! 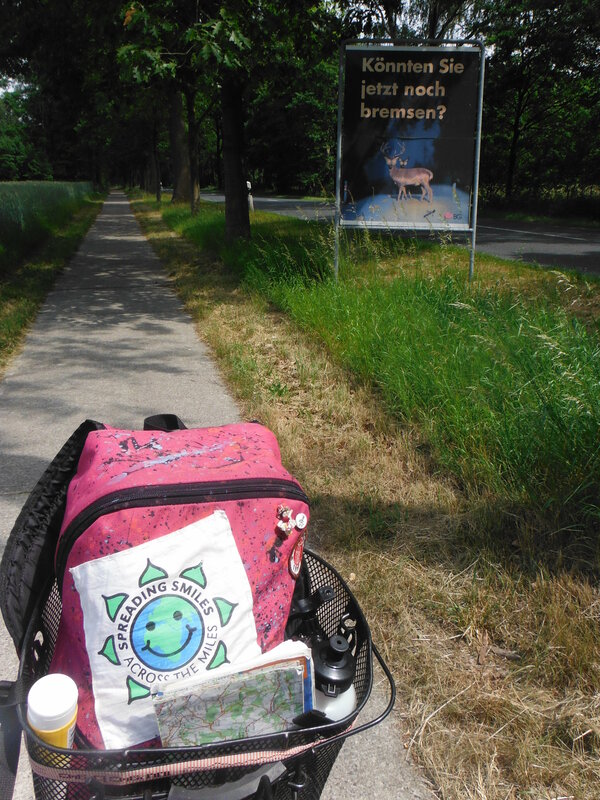 Goodbye Bremen and hello wildlife…. I said my goodbyes and set off in the afternoon sunshine and flew off along the river, enjoying the busy banks as people enjoyed the heat in and out of the water. Feeling strong and positive about the next leg of my adventures I looked forward to some more freedom camping in some beautiful spots and the prospect of meeting amazing people along the way. The time flew by and after almost no time at all dusk was falling and I decided to set up camp after 40 miles/ 64km away in a large wooded area with not a house in sight. I set up at the speed of light as my apparently ever so sweet blood seemed to be attracting every mosquito in the area, after quickly shoving my bags inside I set about eating my dinner of mixed veg and lentils that I had prepared in Bremen in the safety of my fly nets! It wasn’t long until the sun had gone and I was settling down for bed when I heard some loud running in the undergrowth outside, I froze feeling completely unsure what do to! The noise got closer and just as I was about to speak up in case an enraged woodsman had come to turf me off his property an almighty roar bellowed through the trees, my heart leapt out of my chest as the screeching and roaring filled my ears…… WTF!!! Was all I could think but after a few seconds of shock I realized that the deathly sounding monster outside my tent was actually just a stag, tho as the roaring continued it started to dawn on me that it might actually be roaring at ME! The thought of being attacked while in this flimsy cloth bag that I was conveniently zipped into did not sound to appealing but as I franticly searched my brain for the best solution my loud, new friend seemed to start walking away while keeping up his warnings until off in the distance I heard some kind of reply/challenge and my heart started to return to its normal rhythm as I realized that I was not the object its interest. It might have taken a while but eventually I settled back down and slept through the night undisturbed! One last picture with Julian and his friends before heading off. 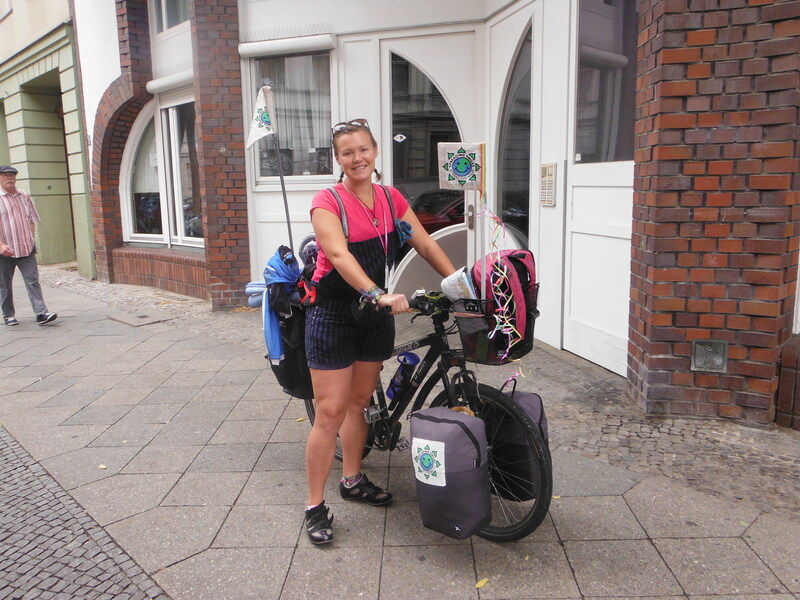 Even tho I was sure that my bike was fine after my fall I knew it would be best to get it checked over before heading off again so after a quick ask around my friends in Bremen I was recommended to go to ‘Freischrauber’, a free, supervised and assisted DIY bicycle repair shop. They welcomed me in with a smile and after a quick explanation they set about checking over my bike, helping me do a couple of minor alterations and answered the few questions I had. We exchanged stickers, I bought them some treats as thanks, hung out for a while chatting and then made arrangements to meet the next day as I was kindly offered an old phone or ‘handy’ for my trip! Outside their office before setting off for our asparagus dinner. 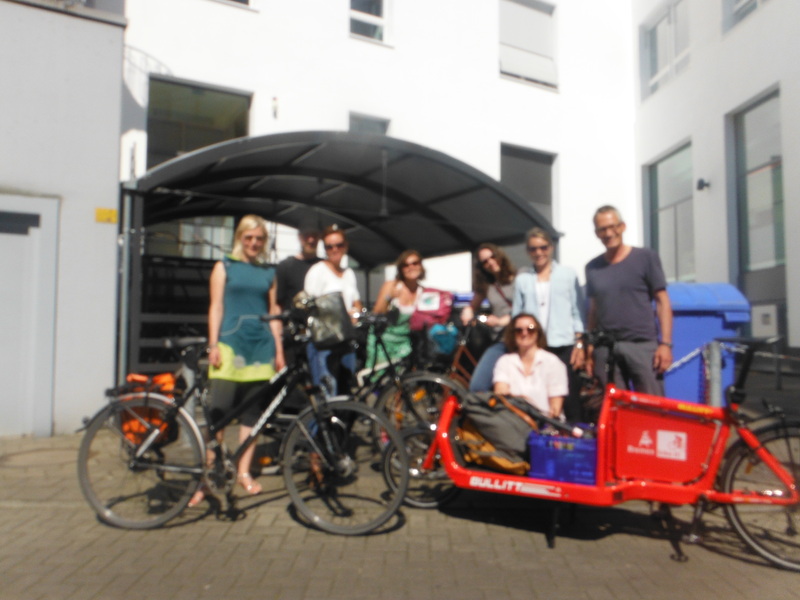 In high spirits I sped off to meet Jens, Tessa and their fun loving group from the office, we sped off, sun shining, Jens with the carrier bike full of drinks, great conversation and of course beautiful surroundings as we followed the bicycle route in the direction of Hamburg. About 20km of scenic countryside, old pretty little towns and beer stops later we arrived at the historic town of Fischerhude where we met some of their other colleagues at Korbers Gasthof for dinner, to follow in tradition we ate our white asparagus with potatoes, fish, bacon, egg, melted butter and hollandaise sauce to top off with. ALLES WAR SEHR LECKER!!!! (everything was delicious – except no meat or fish for me!) 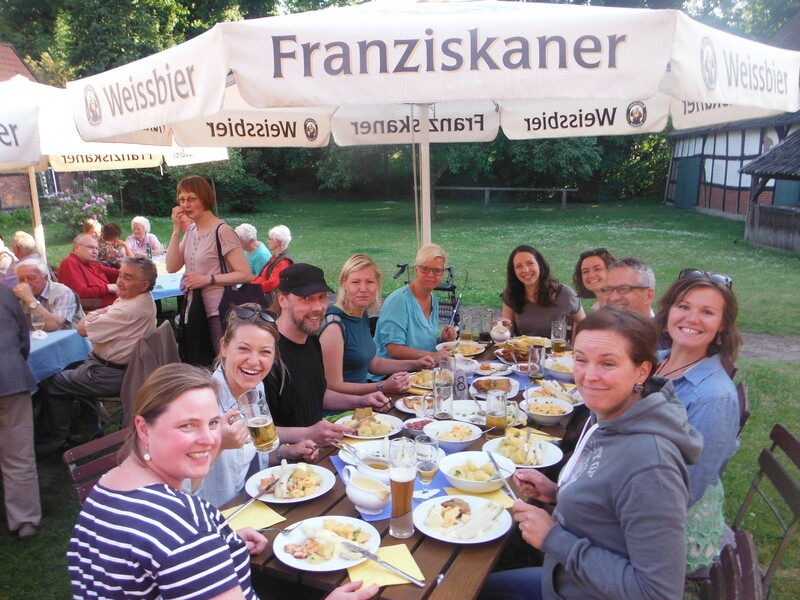 We left with full stomachs and headed back to Bremen, said our goodbyes, made plans for further contact and I thanked them for a great evening. A quick lunch in Bremen then back to Hamburg for the Kino Kabaret! 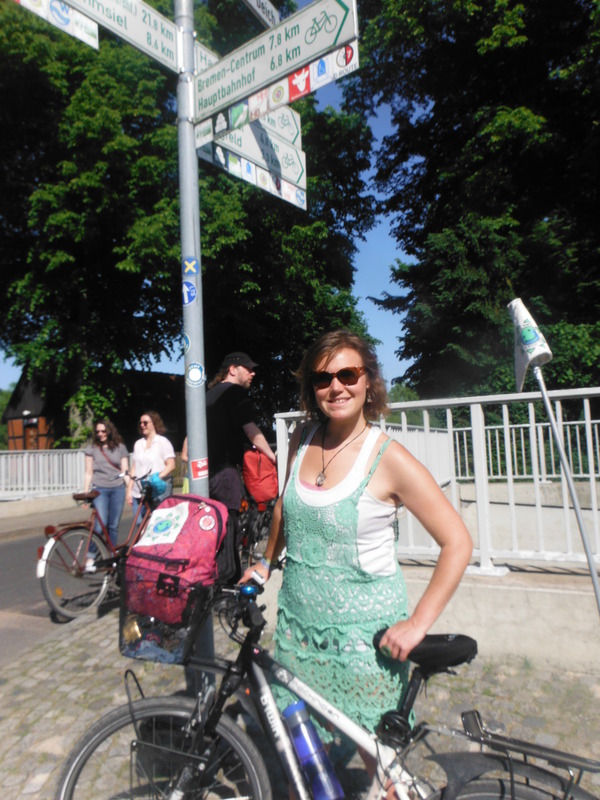 A quick bus ride and I was back in Bremen and ready to meet Jens and Tessa for lunch to talk bikes! We decided that I would join them the following Thursday for an office outing as they were planning to cycle through some pretty little country lanes to have an asparagus or ‘spargel’ dinner in a beautiful old country town as this is the season for it, they would also take some pictures and do an interview at the same time for their online articles. I enjoyed a couple of evenings with my friends in Bremen, found a blah blah car (a ride share website) that would take my bike and on Thursday I headed back to Hamburg. 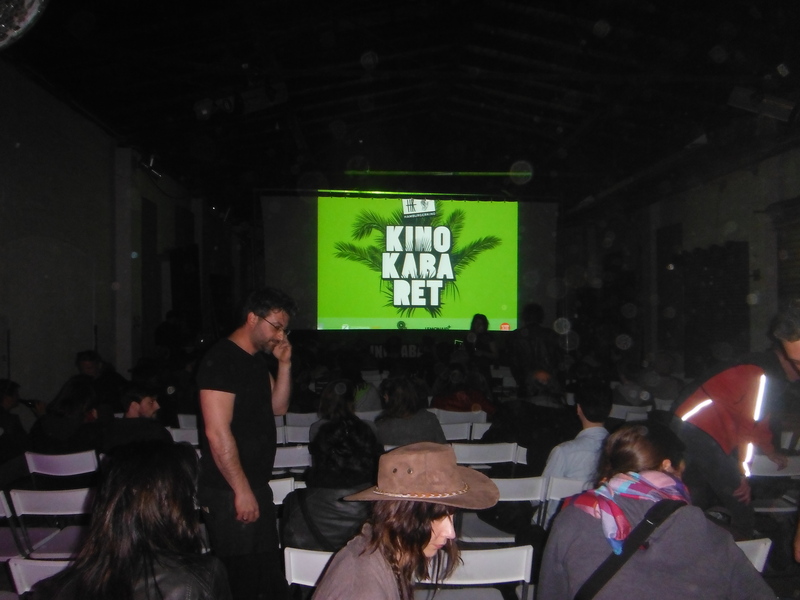 We made our way to the Kino site which was part of the old loading docks and started to get introduced to the awesome crowd that had been working their together all week. After eating an incredible vegetarian dinner together outside in the sunshine we all gathered to watch the 3rd round of films, the pure diversity and talent blew me away and I couldn’t wait to be part of it all…. Getting some footage for my trailer! 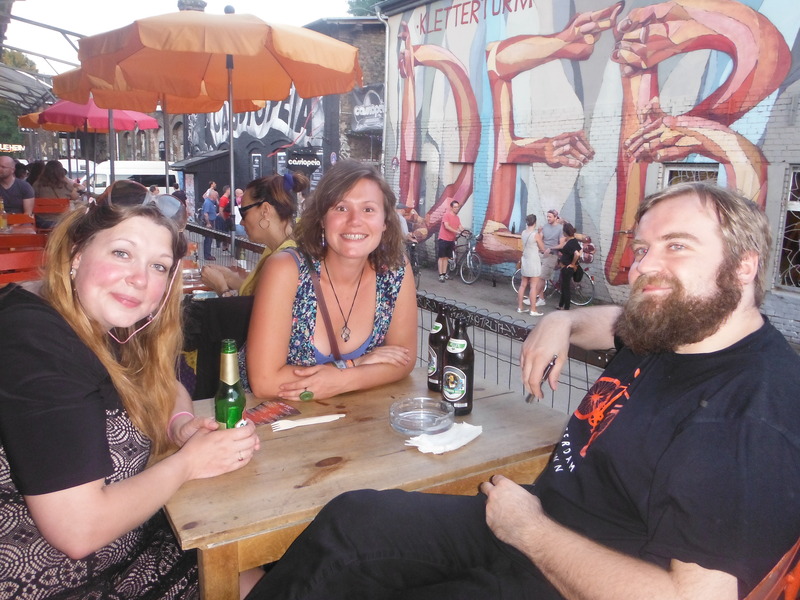 Kino Kabaret guys enjoying delicious food and good times in the sun! The screening from the night I arrived, you could barely move in there on the last night! 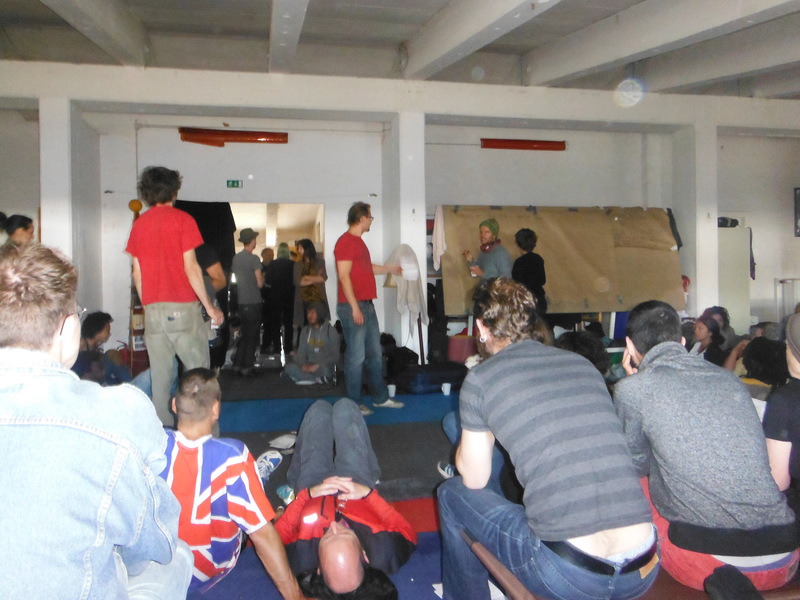 Everyone gathered together to present our films! und the beautiful park and then listened outside along with the other hundreds or thousands of people drinking, having BBQ’s and generally having a good time in the sunshine…… a great way to end my stay in Hamburg as the next day I was back on the bus to Bremen for my outing with Jen’s and Tessa! Thanks again guys, I had a fantastic time and I hope to see you again soon! 🙂 .x. Making the most of my time….. Hello Hamburg! 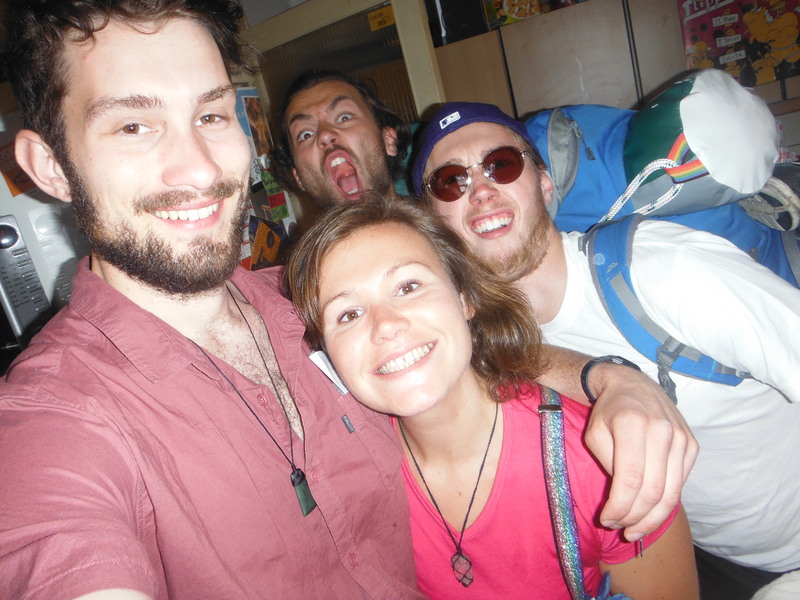 As Hamburg is slightly out of my way in regards to cycling to Berlin I decided that I could make the most of my time by getting the bus their to visit my friend Jan, he is another friend I made in NZ when they came to stay with me in Wellington while traveling through and he welcomed me to come and do the same. 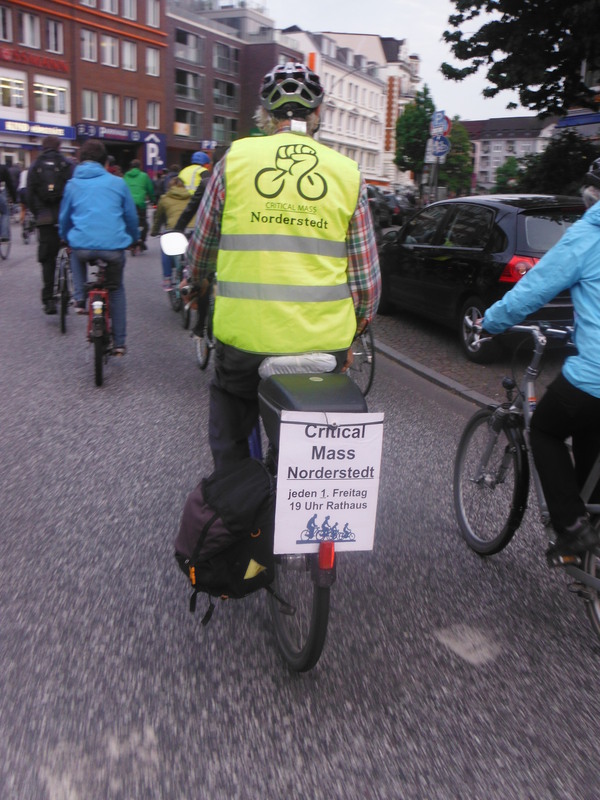 Jens and Tessa had informed me of ‘Critical Mass’ on Friday evening, this is where a large collective of cyclist join together and move as one unit around the streets of a city. 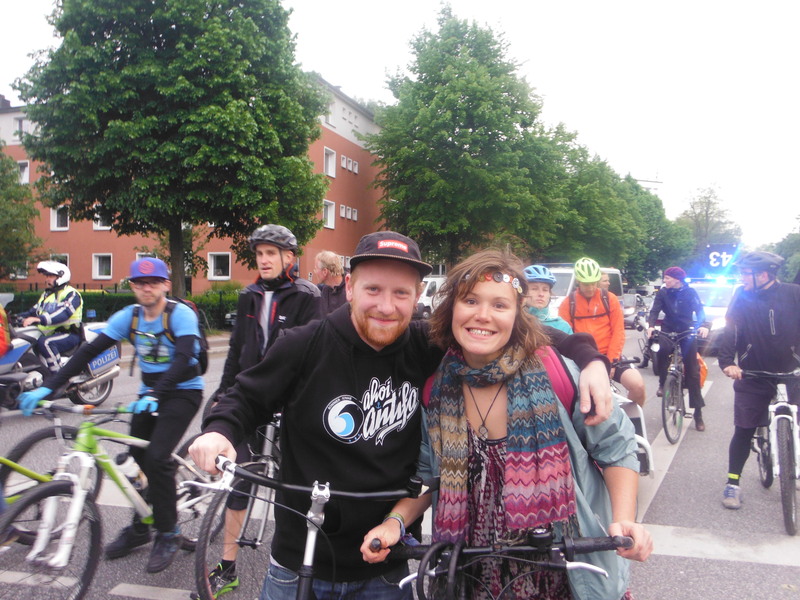 I was really keen to get involved in this so we borrowed a bike then cycled into the city to join the other predicted 4,000 riders and off we went for what I must say was the most enjoyable city tour I have ever taken. 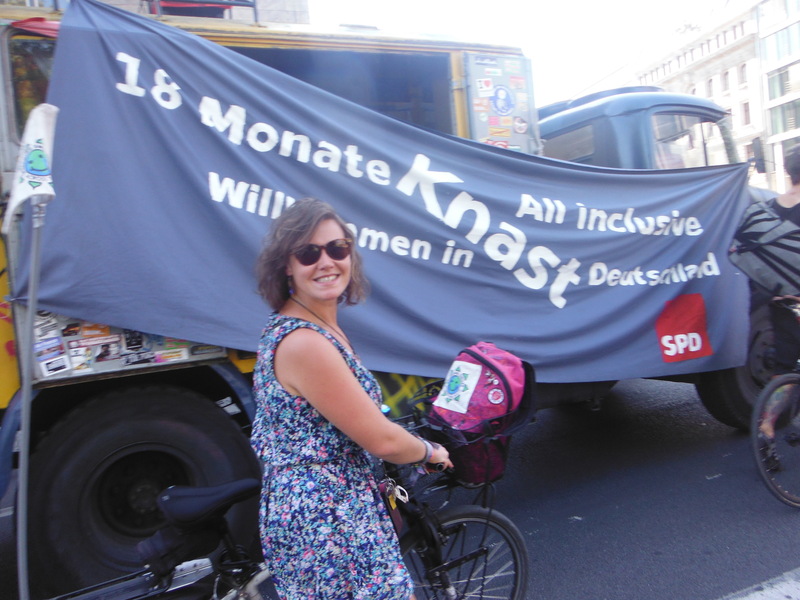 Being a part of that large group, taking over the streets with everyone in high spirits, music pumping out of trailers all around and bubbles flying through the air just felt amazing and a great way to be introduced to Hamburg! We were just 2 out of about 4,000 people cycling the streets that night! 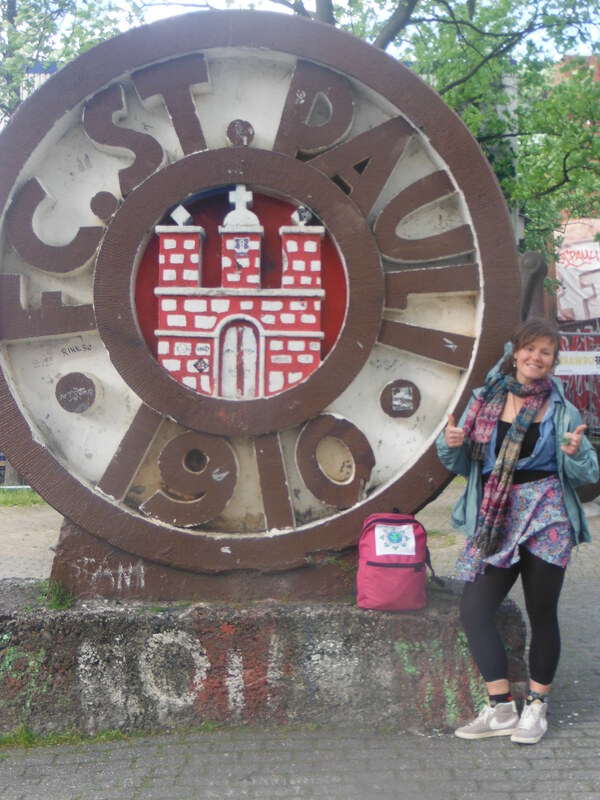 My education of Hamburg had only just begun as the next day we made our way to St Pauli’s Football Stadium to watch the annual supporters match day, as Jan and his friends are huge St Pauli fans this was a big deal. There was a great atmosphere, singing, chanting and drinking beer in the stands while his friends also went about collecting signatures to support a close friend of theirs who is being deported for being a refugee, I found this extremely interesting and I learned a lot about this ongoing issue. Another dominating factor of Hamburg is the graffiti work which decorates almost every corner and displays the work of many well known artists that have been spreading their talents around the city for years. One of the most famous is a man called OZ who has been decorating Hamburg primarily with simple smiley faces for the past 15 years, he unfortunately passed away lest year after being hit my a passing train while doing a piece. He is also known for his large colorful pieces of spots and lines and then also a simple black swirl, he intended to draw a swirl for every person lost in the war, tho we are unsure if he achieved his goal I can tell you that his smiles and swirls really take over the city and they were a pleasure to see! 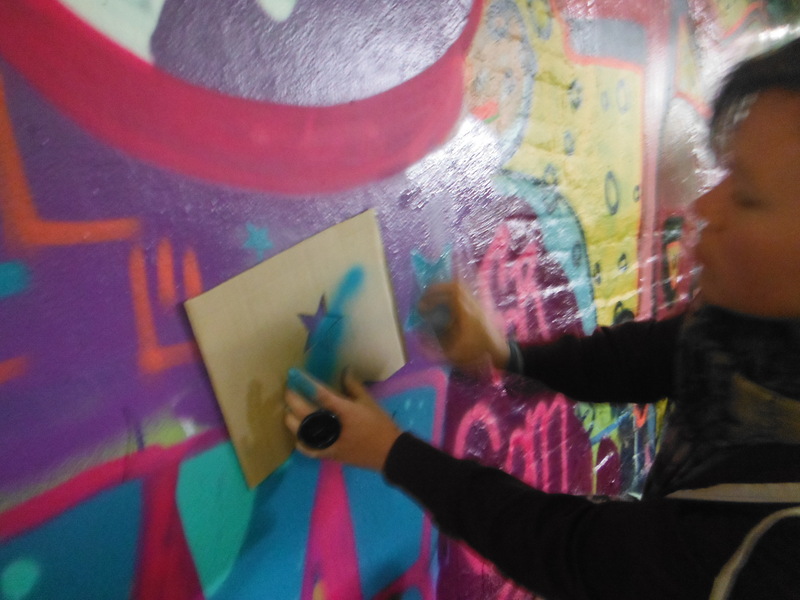 As I expressed such an interest in the graffiti Jan arranged to take me to a spot where people have been given permission to paint, so 3 of them set about their pieces with a third of the wall each! They looked amazing, one was dedicated to their refugee friend Omar and Jan did a piece for me… ‘SPREADIN SMILES ACROSS THE MILES’! Outside the Stadium on the fan match day! 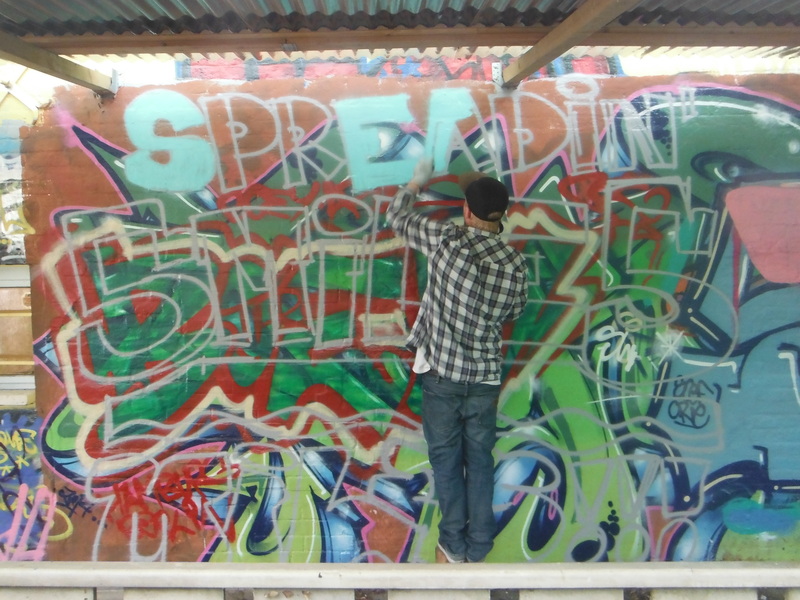 SPREADIN SMILES ACROSS THE MILES….. felt amazing to see it up on the wall! Thanks Jan! .x.